Trade war talk continues to hound industrials, making them the worst-looking sector on the Street right now. But financials, or bank stocks, come in a close second. Ever since peaking in January, the Financial Sector SPDR Fund (NYSEARCA:XLF) has been firmly in the bears’ grasp. Last week’s slide carried XLF back below its 200-day moving average, again — but this time we’ve closed below it for six days in a row. The previous probes below this oft-watched smoothing mechanism only lasted a day before buyers swooped in to right the ship. Volume patterns aren’t helping either. The past 10 trading sessions are a sea of red with six of the days suffering distribution. A thorough survey of the sector revealed three bank stocks on the brink of big-league breakdowns. Check them out. 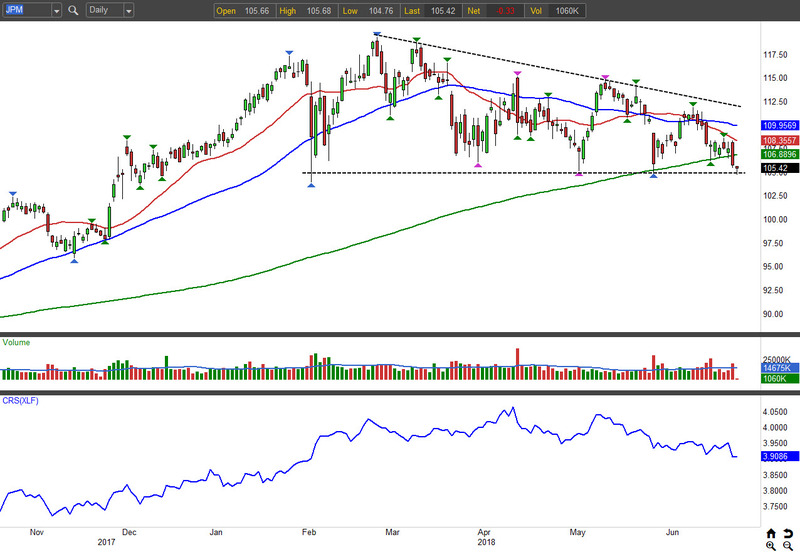 JPMorgan Chase (NYSE:JPM) leads the group with a deadly looking descending triangle pattern. The series of lower pivot highs that has formed since February shows that sellers are in complete control. Relative weakness has also plagued JPM shares for the past six weeks. That means it has fallen further than the financial sector (XLF), which reflects that traders are particularly displeased with it. Volume patterns look equally dismal, with distribution days littering the landscape. A break of support near $105 will spell trouble. Bank of America (NYSE:BAC) shares look virtually identical to JPM. A descending triangle has taken root with numerous failed rebound attempts. Support near $28.70 has been tested four times now, and with each test, buyers’ resolve has to be waning. Like JPMorgan, BAC has been underperforming the XLF, making it a laggard, not a leader. This morning’s weakness is creating what could be the breakdown bears have been waiting for. If you want to join them, consider buying the Aug $29 puts for around $1.15. Your risk is limited, and the reward is unlimited until Aug expiration. 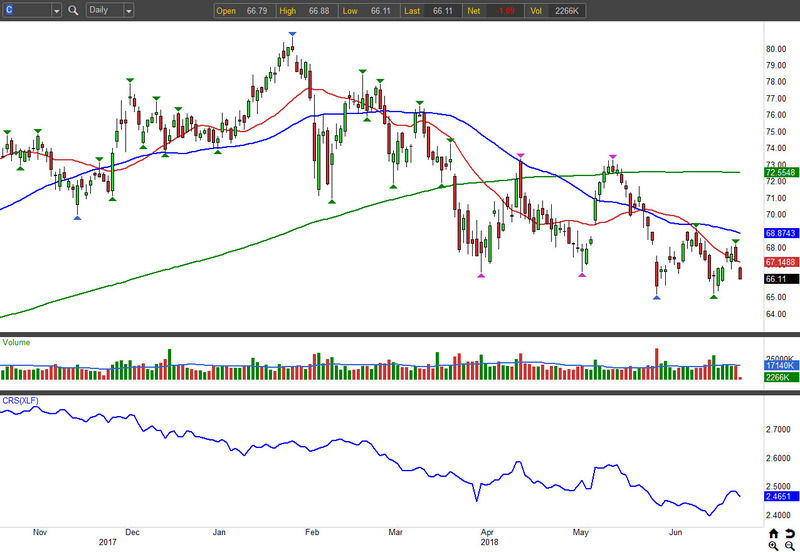 Citigroup (NYSE:C) rounds us out with a downtrend that is far more mature than the tops in its predecessors. C shares fell below the 200-day moving average long ago, flashing relative weakness galore. Its downtrend has been fairly consistent dragging the 50-day and 20-day moving averages lower. Last week’s retracement created a lower-risk entry for new bear trades, and this morning’s drop is confirming the next slide is upon us. 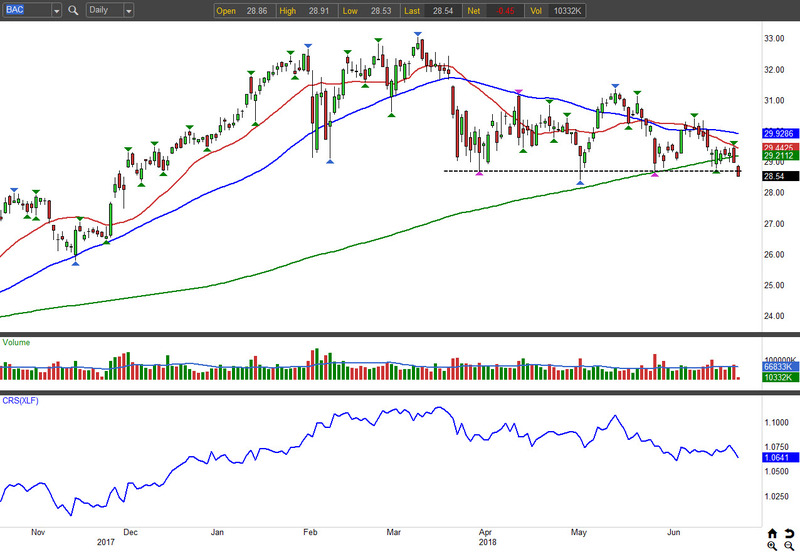 Buying the Aug $67.50 puts for around $3 offers a limited-risk way to bank on further weakness. The next earnings announcement is looming on July 13, so consider exiting before then to avoid the event risk. As of this writing, Tyler Craig held bearish positions in XLF. Want more education on how to trade? Check out his trading blog, Tales of a Technician. Article printed from InvestorPlace Media, https://investorplace.com/2018/06/3-bank-stocks-on-the-brink/.